1 Preheat the oven to 200°C, 180° C fan , Gas mark 6. Clean potatoes, pierce with fork and place in the oven. Bake until tender for about 1hr. Remove from the oven and allow to cool. 2 Meanwhile, prepare filling by melting the Flora Buttery in a small frying pan. Add the diced onion and fry for about 5 minutes, then add the bacon and continue until bacon is cooked. Then add the Knorr Mixed Herb Flavour Pot and Elmlea Single and stir to bring sauce to the boil. Crack the egg, add to the sauce and continue to stir. The sauce will cook the egg. Ensure not to overcook the egg. Remove the sauce from the stove. 3 Cut each potato in half and scoop out the flesh leaving a shell about 5mm thick. 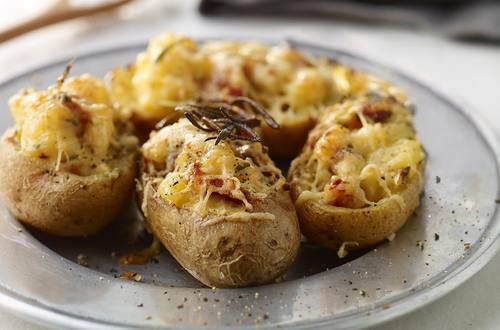 4 Mix together potato flesh and sauce with half of the grated cheese. Distribute the filling evenly among the shells. Top with the remaining cheese. 5 Place on a baking sheet and bake for about 30 minutes or until the cheese melts.